to rid your building of roaches or your money back. Seabright baits are formulated to attract the emerging nymphs (babies) before they mature, thus ending the cycle. Baits contain an irresistible blend of food items, a humectant for moisture, and a small amount of boric acid. The food masks the presence of the active ingredient and tricks the nymphs into eating it. The Roach Free System arrives fresh with easy to follow instructions in English and Spanish. Installation takes only minutes and requires no preparation. Additionally, Seabright materials remain highly effective for three to four months. And we always ship your order the same day that it is received. 48 Traps and 48 Baits are packed together in one case. Quantity discounts and annual subscriptions are also available. Unopened baits and traps have a shelf life of two years. To prevent reinfestation, place fresh traps to monitor any new insect activity. 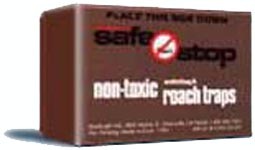 Instead of chasing roaches into hiding with toxic sprays and powders, the Roach Free System attracts them. Seabright's success lies in powerful food-grade attractants contained in traps and baits. Together, traps and baits are the most effective way to make your property Roach Free. Apartment managers tell us our easy-to-use material has "rid our building of roaches for the first time in memory". Seabright traps have been awarded the "Good Housekeeping Seal of Approval"